Bibi Ka Maqbara was built by Prince Azam Shah, son of Emperor Aurangzeb, in the late 17th century as a loving tribute to his mother, Dilras Bano Begam. The monument's name translates literally to 'Tomb of the Lady', but has earned the nickname 'poor man’s Taj' because of its resemblance to the Taj Mahal. 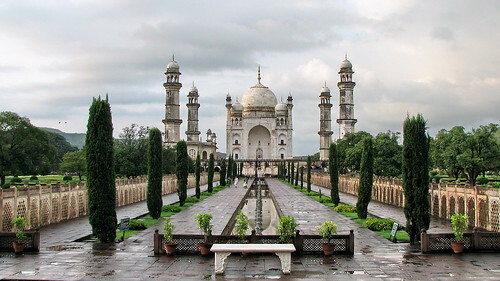 It is situated in Aurangabad, Maharashtra. After a shower colors are vivid and more beautiful.